How to read a Schengen Visa Sticker? 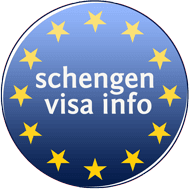 If you have been granted a Schengen visa, there are several pieces of important information on the visa sticker. The visa sticker information is provided in three languages: English, French and German. Please read carefully the following article to understand better the meaning of the labels attached into a Schengen visa. A visa sticker always contains information on the countries that its holder is permitted to visit. The phrases «VALID FOR», «VALABLE PUR» and «GULTIG FUR» are set before the name of the territory you are permitted to enter with the visa you have obtained. If next to those words is written «ETATS SCHENGEN» or «SCHENGEN STATES», then it means that the visa is valid in all Schengen states, and the visa holder can visit each of them, once inside the territory. If there are listed just some of the acronyms of the names of these countries i.e. «LVA, M, N, NL, P, PL» then this means you are permitted to enter only Latvia, Malta, Norway, Netherlands, Portugal and Poland. Whereas, if the visa contains the following label «ETATS SCHENGEN (-country acronym)» – then this means the visa is valid for all Schengen countries, expect for that country i.e. expect Sweden if the label is «ETATS SCHENGEN (-S)». You will be unable to enter depending on the country code after the minus sign. Label «name of country» – means that the visa is valid only for the respective territory, and its holder is not permitted to move to the other countries of the Schengen Area if he / she does not have another visa. Next to the labels «FROM», «DU» and «VOM» is given the first day you are permitted to enter the Schengen Area, whereas near the labels “UNTIL”, “AU”, and “BIS” is given the last day when you will have to leave the Schengen or the countries in which you are permitted to remain during your stay. The label “NUMBER OF ENTRIES”, “NOMBRE D’ETNREES” and “ANZAHL DER EINREISEN” stands for the number of times a person is permitted to enter the Schengen Area. Label «MULT» – means that the holder is authorized to enter more than one time in the Schengen Area, as often as they wish, as long as they do not exceed their permitted duration of stay. Label «1» – means that the holder is authorized to enter only once in the Schengen Area. Label «2» – means that the holder is authorized to enter twice in the Schengen Area, and so on. 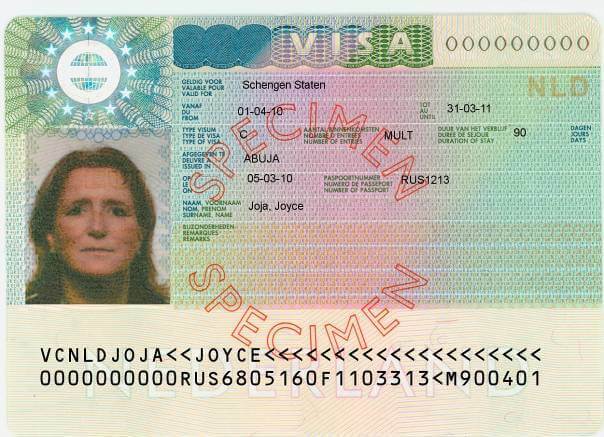 Label “DURATION OF STAY”, “DUREE DE SEJOUR” and “DAUER DES AUFENTHALTS” and immediately next to it is the words “DAYS”, “JOURS” and “TAGE” stand for the number of days a person is permitted to remain in the Schengen Zone within the given Schengen visa validity. Warning: If you stay longer than the amount of days listed in your visa, you might be fined and future Schengen visa applications are subject to further review and possible refusal. The processing time for future visa applications may also be extended to 30-60 days. Depending on the amount of days you stay too long, you could risk being banned for 2-5 years. Label «A» – stands for the visa type A- Airport visa, that does not permit the holder to pass the “international airport zone”. Label «C» – stands for the visa type C – or short-stay visa, that does not permit the holder to stay more than 3 months in the Schengen Area. Label «D» – stands for the visa type D – or long-term visa, which permits the holder to stay more than 3 months. Label “ISSUED IN”, “DILIVRE A” and “SUGESTELLT IN” stands right next to the name of the city where is located the embassy or consulate that issued the visa. Label “ON”, “LE” and “AM” – is for the date when the visa is issued. Label “NUMBER OF PASSPORT”, “NUMERO DE PASSEPORT” and “NUMMER DES PASSES” – is for the passport number of the visa holder. Label “SURNAME, NAME”, “NOM, PRENOM” and “NAME, VORNAME” – is for the name and surname of the visa holder. Label “REMARKS”, “REMARQUES” and “BEMERKUNGEN” stand to tell the purpose of the visa holder behind their travel to the Schengen.